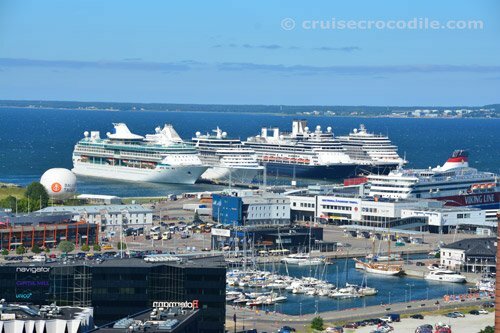 Tallinn cruise port - Top rated cruise port guide for cruise ship passengers! Our Tallinn cruise port guide gives you information about the docking location, cruise dock, transportation options and much more! 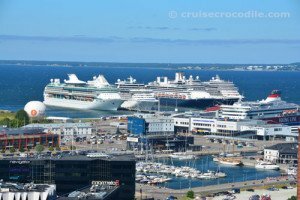 Welcome to the Tallinn cruise port guide. When thinking of Tallinn people automatically think about twisting cobblestone lanes, iron street lamps, gothic spires and medieval markets. 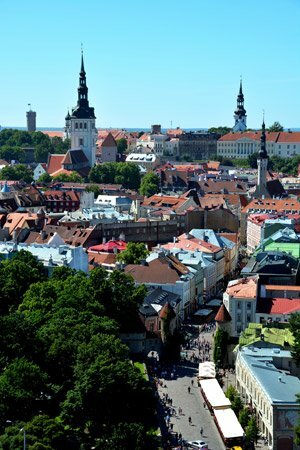 It is the famous old town that makes Tallinn renowned beyond its borders. It truly is one of the most enchanting destinations on the Baltic, because you’ll have the feeling you are taking a step back in time. The old town of Tallinn was build from the 13th to 16th century, back in the days when Tallinn was an important member of the Hanseatic League. The Hanseatic League was basicly the European Union of medieval Europe. It was the first and most powerfull trading alliance Northern Europe has seen. Many different cities on the Baltic Sea were born as a trading post and alliance of the Hansa. Therefore there are a lot of medieval old towns still standing in this part of the world as a proof of wealth that was brought by the Hanseatic League. Tallinn is the perfect example of such a place. Explore the old town by foot and you’ll come across the lower part where the merchants used to live and the upper town where still up to this day the most important buildings of Tallinn stand. Read underneath how to get from Tallinn’s cruise port to the old town. On a busy day in port 4 ships will dock here. Tallinn is a popular destination and more and more Estonia is getting a beloved tourist destination. The facilities on the dock are quite good. 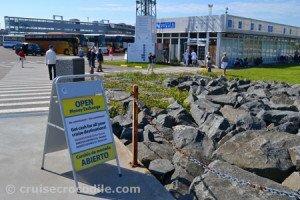 You have your tourist centre, the local market and a great parking lot with all kinds of transportation like tourist busses and taxis. The tourist centre is amazing. You’ll find great souvenirs, tourist information, audio-guides, exchange facilities and wi-fi here. The city of Tallinn is one of the best cruise destinations in the Baltic. Click here to find out what to see and do in Tallinn. How are you? – kuidas sul läheb? 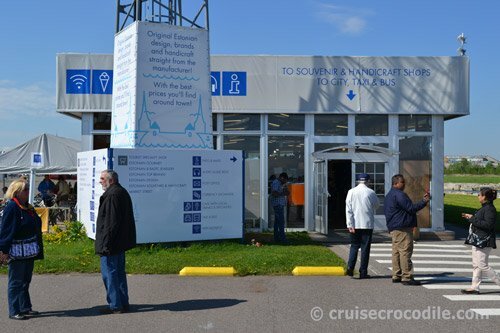 Welcome to the Tallinn cruise port guide. In Tallinn your cruise ship will most likely dock at the cruise centre. At this moment there about 4 spots for the bigger cruise ships here. It is about a little over 2 km walk from the ship to get to the town hall square (middle of the centre). When you walk off the pier you will come across the building you see on the left picture. The facilities that are offered here are: info & maps, audio guides rent, post office, currency exchange, cafe with local drinks and specialties, taxi and bus and wi-fi hotspot. Behind this building there is also a very nice souvenir market. As you exit the ship and walk off the pier, look to the right where you see the large clock towers of the old town. Simply aim for the clocks towers to find your way to town. The old town is best to be explored by foot as traffic is not welcome in the narrow cobblestone streets. Some people who have mobility challenges sometimes take a taxi from the dock to the Russian Cathedral for about 15 euro. This will make sure you are at the highest and furthest point of the centre. They walk back to the ship. This is about 2,5 km walk, but all downhill and you can hit all the highlights of town along the way. Your have a few options on how to get to the city centre from the port. It is either a 2 km walk. You can take a taxi for +/- 10 euro one way per taxi and there is also a hop on hop off bus available from the port to take to the old town. The hop on hop off bus even goes further afield to the places of interest outside of the city centre. The city of Tallinn has a rather good public transportation system available. Although the trams and buses do not directly come to the cruise terminal. The closest public transport stop is at Sadama street in front of Terminal A, see map above. You’ll find bus 2 comes by this stop. To get to the city centre you can get off at A.Laikmaa stop. The bus departs about 3 times per hour. Find more information and plan your journey on http://soiduplaan.tallinn.ee/#bus/en. – How far is the city centre? That is about 2 km walk from the ship. – Can I pay with euro? Yes, the official currency is euro. – How do I visit the KGB museum. By making a reservation through e-mail beforehand or by hopping into the Viru hotel in the early morning to make a reservation. – Can you make pictures in the Aleksandre Nevsky cathedral? No. – Is the old town worth to visit the whole day? We would recommend half day in the old town, half day either a museum, the open-air museum or festival grounds. Pirita beach You’ll notice that as soon as the sun is out the Estonians are as well. It might still only be 10 degrees, but that is warm enough for the locals. Why not join them on a sunny day on Pirita beach. From port it is about 3,5 km / 10 min drive to the east. This is the 1st monument in Estonia made by Estonian. It is a bronze monument erected in 1902 to mark the 9th anniversay of the sinking of the Russian warship Rusalka. From port it is about 3,5 km / 10 min drive. This cathedral might seem out of place here in the medieval Tallinn because of its colorful Russian appearance. Most Estionians aren’t thrilled about the church due to its placement and early political significance. It was established here in 1900 as a symbol of Russian power over the Estonian people. Now the cathedral is the main place of worship for Estonia’s Russian Orthodox faith. From port it is 2,5 km / 35 min walk to the south west. The flower market is in the old lower town of Tallinn. Buy your local flowers here or see what is different in Tallinn compared to home. From port it is about 2 km / 25 min. walk to the south. It was here in 1988 that the Singing revolution; a massive, musical demonstration against Sovjet rule set Estonia on its road towards independence. A third of all Estonians gathered here to demand their freedom by singing about independence and their love for Estonia. Learn more about this event by watching the movie “The Singing Revolution”. From port it is 4 km to the east. Reach it by public transport, hop on hop off bus or taxi. Tallinn has a late Gothic Town Hall building. It is one of the most famed symbols of the city. Historically it served as a market and meeting place. Today the square remains the social heart of the city. Make sure not to miss this square, there is always something nice to do here. From port it is 2 km/ 25 min walk to the south west. This 14th century tower is a national symbol. Tradition dictates that whatever national flag flies over the tower rules Estonia. Each day at sunrise the Estonian flag is raised above the tower to the tune of the national anthem. From port it is 2,5 km / 35 min walk to the south west. The Tallinn cruise dock offers great facilities. 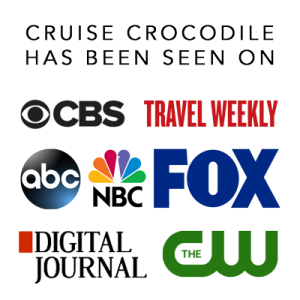 You will find a welcoming center right off the dock. Tourist information is there to get you started on your day ashore and you can buy your souvenirs directly at the dock. More information on how to get out and about can be found in the full Tallinn cruise port guide. The middle ages was a time of power politics and Tallinn was constantly under attack. The protect their beloved city they started to build a city wall in the 13th century. By its heyday in the 16th century the wall was 2,4 km long and 14 to 16 meters high and 3 meters thick. Today 1,9 km of the original towers and walls are still standing. Best views over the walls you will have from the upper town. Find the town wall in the old town about 2 km walk from the port. The Viru Hotel was one of the first skyscrapers in Tallinn and a very prominent hotel in town. Anybody who was anybody would stay here. The hotel had 22 floors, but what nobody knew is that there was a secret 23rd floor on which the KGB was situated to listen to every word that was said in the hotel. Book prehand through Viru Hotel Tallinn to ensure a spot on the tour that goes to the 23rd floor.